Heat from electronics is increasing in all industries including power generation, high power electronics, and aerospace. Increasingly, there is a need for very high efficiency thermal management devices that can pull heat out of a small area at higher and higher rates. 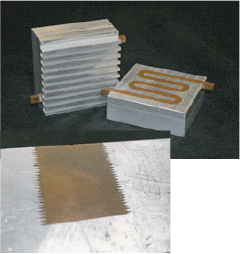 Historically, these specialty heat exchangers have been made through traditional CNC machining and brazing. These techniques limit the shape of the internal passageway while also adding complicated joining issues. Traditional processes are expensive, time consuming, and greatly limit the creativity of design engineers. Fabrisonic’s metal 3D printing offers the promise of creating parts with complex internal geometries not possible with conventional manufacturing approaches alone. Until recently, 3D printed heat exchangers have not been fully accepted due to the inability to build parts with the high thermally conductive metals that industry requires. 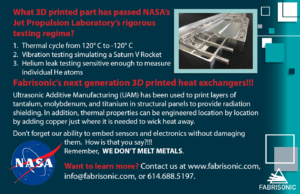 Thanks to the power of UAM, Fabrisonic has broken down this barrier and routinely prints copper and aluminum heat exchangers where other additive technologies fall short. 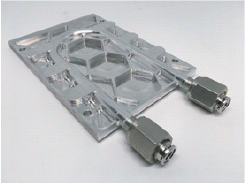 Cube Sat Cold Plate – The satellite industry is constantly driving for more efficiency with a smaller size. This push means that engineers need to get creative to design parts that fulfill multiple roles. 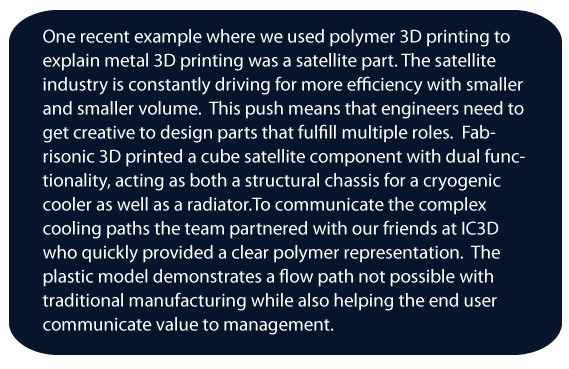 In one application, Fabrisonic 3D printed a cube satellite component with dual functionality. The component acted as both a structural chassis for a cryogenic cooler as well as a radiator. The complex cooling paths as illustrated in the plastic model demonstrate a flow path not possible without the use of 3D printing. UAM enables these complex, low volume designs with the rapid turnaround that 3D printing is known to deliver. Interstellar Thermal Management – NASA constantly makes headlines with its interstellar devices. However, for decades the thermal management systems on these satellites and rovers has been limited to bent metal tubes glued along the outside of a vehicle’s chassis. 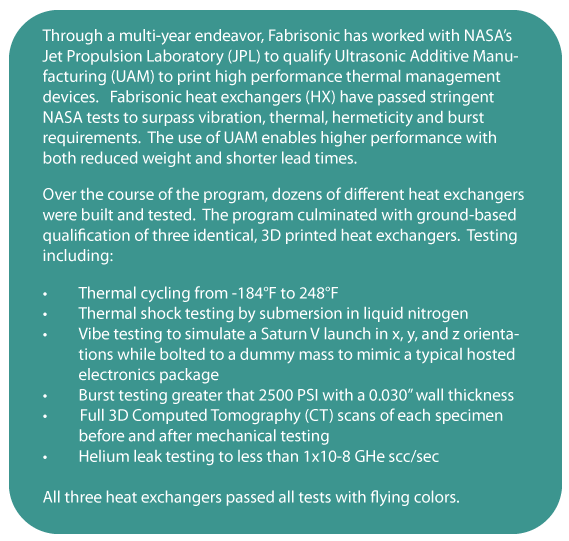 Through a multi-year endeavor, Fabrisonic has worked with NASA JPL to qualify UAM as the next technology for printing interstellar thermal management devices. A Fabrisonic heat exchanger has passed stringent NASA qualifications include vibration, thermal, hermeticity and burst tests. 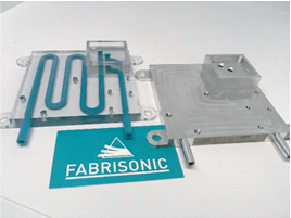 Finding the Best of Copper & Aluminum – Fabrisonic routinely prints both copper and aluminum parts in both homogeneous and multi-metal combinations. 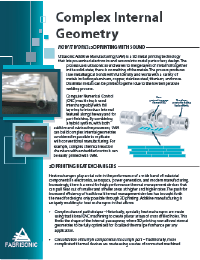 Printing copper in high heat flux regions leverages its ability to quickly wick heat away. However, printing surrounding structure out of aluminum takes advantage of its lightweight and high strength.